2011 saw our transition and change in focus. We no longer emphasize bringing Mayas to the workshops, now we bring the workshops to the Mayas. 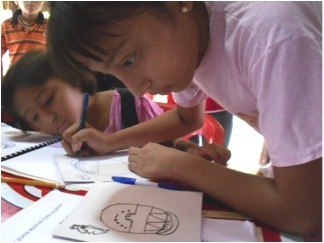 In 2011 we gave seven mini-grants for workshops in Maya-speaking communities and distributed three digital projectors. Details of these events and much more are coming in our future news items. For now, these two pictures give just a taste of what we are accomplishing. 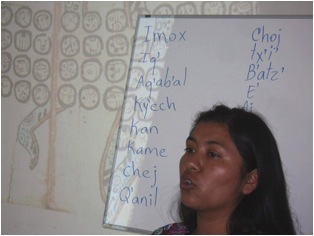 Projected on the screen behind, the 20 Maya day names from the Madrid Codex blend seamlessly with the living calendar, 20 days in the Mam language read by MAM colleague Ana Elizabeth López Ramírez of San Ildefonso Ixtahuacan, Huehuetenango. More coming in 20 days. Join us, support us, and share the feeling. Very well done site. Congrats.